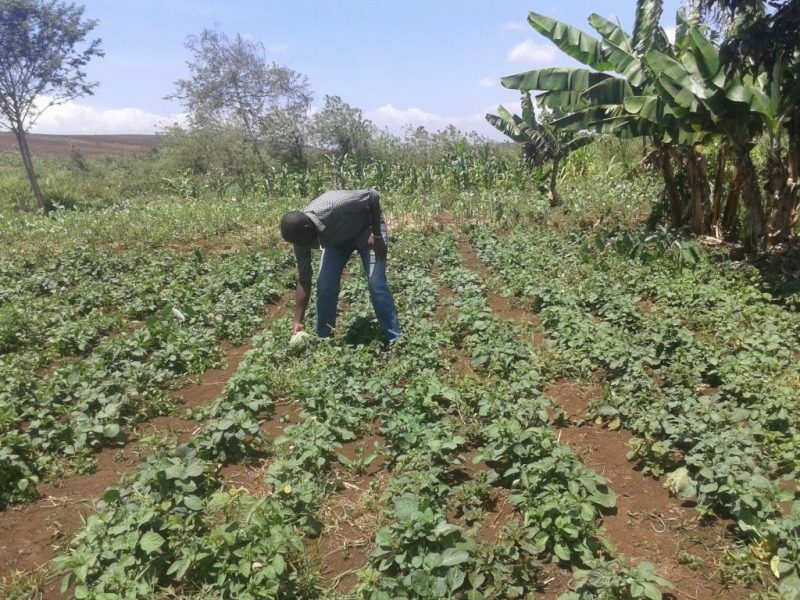 With KES 500 (about $4.80 USD), two acres of his family’s land, and a passion for agriculture, Peter Nyoike started Muthoni Agrobiz, a horticultural business in Murang’a County. Peter was happy to be making a living growing food, but a friend who knew his passion for agriculture believed he could do more. Peter’s friend told him about DOT Kenya. Participating in DOT programs opened Peter’s eyes to new possibilities for his business. As he conducted market research, he discovered that media reports of pesticide poisoning had raised concerns about pesticides and his soon-to-be customers preferred organic produce. He also learned that customers who needed fresh vegetables in bulk, such as hotels, found it difficult to find the produce they needed in the dry season. Armed with this information, Peter re-imagined his business. He began growing organic produce, and he accessed a local stream and water storage system to ensure he could produce vegetables year-round. Kale, cabbage, onion, carrots, dhania, spinach, tomatoes – soon Peter had a thriving supply of vegetables, fruit and herbs, and eager customers in hotels, markets, and supermarkets in the Thika area. Peter had not just become a more successful entrepreneur – he was also becoming a social entrepreneur, using his business to create opportunities and transform his community. Many young people in Peter’s community are unemployed, even as their family land sat idle, a potential opportunity going to waste. While participating in DOT training, Peter came to realize how agribusiness could relieve youth unemployment in Kenya. With DOT’s support, Peter created a youth-focused mentorship model to equip young people to establish their own organic farms. He established a demo farm, where he has trained 10 young people on farming and agribusiness. He provides the training for free, and offers those who complete it the opportunity to purchase seedlings to establish their farms. As their seedlings grow and yield a harvest, this network of young farmers can join together to improve their bargaining power as they sell to large customers, increasing the group’s overall income. In this way, Peter’s mentorship model not only enables other young people to become farmers, but also allows them to reach a larger market and earn more money. Even for a social enterprise as rooted in the physical world as Peter’s, the digital skills he developed in DOT’s programs have been important to his success. Peter and the young people he has mentored rely on digital technology to conduct market research and market their produce. Peter also relies on social media to promote his demo farm and reach out to young people interested in learning about organic farming. With the tools, knowledge and networks he developed at DOT, Peter has not only been able to establish an innovative social enterprise–he has also been able to strengthen his business. He has doubled his land size, and hired seven people from his local community to work on his farm, including five women. As his profits have grown, so have his goals. He plans to set up an irrigation system to help him grow more produce more efficiently, and intends to keep expanding his supply network, reaching more and more hotels and supermarkets in Kenya. He’s not going to stop there, though–Peter dreams of exploring other markets outside the country, and has a goal of eventually selling his produce internationally.